Meeting under the grim shadow of the overnight Las Vegas massacre, the leadership of the global organisation on Monday renewed its commitment to embodying Mahatma Gandhi's belief in the power of nonviolence.Gandhi's principle of nonviolence was the core principle of the UN, said General Assembly President Miroslav Lajcak speaking at the observance of Gandhi Jayanti as the International Day of Nonviolence here. 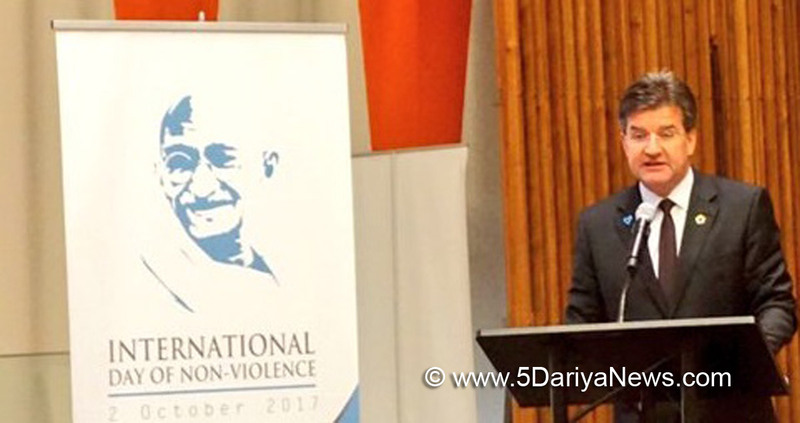 "The UN is the greatest promoter of nonviolence," he declared. "Everyday, the UN is using non-violent means to strive for peace and decent life for all on a sustainable planet. "Secretary-General Antonio Guterres's Chef de Cabinet Maria Luiza Ribeiro Viotti recalled that Gndhi declared nonviolence the "greatest weapon" and said: "We are committed to translate this belief into action." Nonviolence underpins the unity of the UN in its quest for a peaceful world amid a rising tide of messages of hatred against minorities and refugees, and xenophobia, she said.India's Permanent Representative Syed Akbaruddin said that violent incidents were on the rise with civilians as the main victims in recent times compared to a century ago when 90 percent of those killed in conflicts were non-civilians.Military spending was also on the rise as was violence being done to the environment, he said.Gandhi's messages had the answers for the world to find solutions to these problems, he said. "We are not in the world that Gandhi dreamed of," Lajcak said. But as the global leader for nonviolence, the UN should promote peaceful methods of conflict resolution like mediation, he said.Prevention, he said, would be at the core of the activities current session of the General Assembly over which he has been elected to preside.While the UN peacekeeping missions are deployed to prevent conflicts or try to end them, the Security Council that mandates them has come under criticism by India and several countries for not giving adequate importance in the first place to prevention of conflicts through political and other means.Another element in the mission for prevention of violence, Lajcak said, is spreading the message of nonviolence with community and religious leaders, and especially the youth.For each message of violence, there should be two messages of peace, he said.On Sunday night in Las Vegas, a gunman killed more than 50 people and injured over 200 people at a concert in the worst shooting incident in modern US history.